Ramez Naam is one of those ridiculously well-credentialed individuals who has his pulse on every aspect of global innovation. During his career, Naam has helped drive machine learning innovation at Microsoft, served as the CEO of Apex NanoTechnologies, the world’s first company devoted to software tools to accelerate molecular design, and has published award winning non-fiction and science-fiction books. Naam currently teaches at Singularity University in Silicon Valley with futurists Peter Diamandis (Founder of X-Prize) and Ray Kurzweil (Inventor and Chief Engineer at Google). He’s a data-driven optimist with a deep understanding of how technology, policy and business can converge to solve humanity’s grand challenges. In a word, Naam is a visionary. Conscious Connection had the opportunity to speak with Naam and hear his lecture at Sustainable Brands San Diego on June 1, 2015. According to Naam, the environmental problems facing our planet are “incredibly real, very pressing, and tremendous in scope.” Forests drive rainfall patterns, filter our water, and house three-quarters of the on-land biodiversity in the world; half of the world’s original forests are now gone. While our demand for food drives 85 percent of deforestation, food yields are not currently keeping up with expected food demand. 70 percent of the fresh water in society is used to grow our food; as demand for food is increased, this resource will be increasingly taxed. While we have largely tackled air quality problems in the United States, poor air quality effects more than 2 billion people in China and India. The planet’s temperature has risen two degrees since the dawn of the industrial age; this exacerbates drought in some areas, causes severe rainfall and flooding in other areas, and puts pressure on food production and forests. Thankfully, Naam believes that while our situation is dire, it is addressable. As evidence, he points to the Cuyahoga River, which was so polluted in 1969 that the river actually caught on fire; that river is now in pristine condition. Smog in New York City, which used to be as bad as that in today’s Beijing, is significantly improved today. The ozone layer, which was significantly depleted in the 1980’s, is in considerably better condition thanks to the Montreal Protocol. Naam notes that virtually every pollutant in North America, Europe, and in developed nations in general has plunged in its levels over the past 40 years, and the cost has always ended up being a fraction of the EPA’s estimates. The way these problems have been solved is by fixing the broken systems that allowed these problems to occur. This involved innovation in three areas. First, policies needed to be created to support the environmental causes. Second, new technologies needed to be created to deal with the pollution. And finally, financially sound business models needed to be created to solve the problems. The common denominator that has driven solutions to environmental problems is the generation of new ideas. With this infinite resource, Naam feels confident that the world will be able to innovate its way out of our current crises. He cites the following examples of progress as hope for the future. Water: While our water problems are very real, progress has been made. According to a 2010 study, we currently use less water per person in the United States since 1943. Israel is a leader on the forefront of water issues, in that most of its water is generated from desalination and waste water processing. Over the last few years, the energy it takes to produce fresh water from saltwater or wastewater has declined by a factor of 10. Food: In order to meet future demands on our food supply, the world will need to double food production in 40 to 50 years. While this statistic sounds ominous, the fact that the amount of food grown per acre has tripled since 1968 provides some reassurance that such huge goals can be attained. Yields in the US and Europe are currently twice as high as the average global yield per acre, so it is clear that productivity can be improved in other parts of the world. Moreover, a project funded by The Aids Foundation is researching how to take genes that allow soy to fertilize itself and move them into rice and wheat. This process could double yield while reducing costs and reducing dead zones in rivers from fertilizer nitrogen runoff. Energy: The world has done little to harness the power of the sun. The sun hits the Earth with 10,000 times as much energy in any given year as humanity uses from all sources combined. 1 day of human energy used is equivalent to 10 seconds of sunlight. Some of the sun’s power heats different parts of the atmosphere and drives wind. Wind power deployed in the world has increased by 1000 percent in the last decade, and the cost of wind-powered energy has dropped to as low as $0.025 per kwh as of 2013. Solar power makes wind power look slow and stagnant. Over last 35 years or so, the price of solar power/modules has dropped 150 fold. Conveniently, the 1 billion people or so in the world who don’t currently have electricity (e.g. Chile, India, China) live in sunny places. Of course the captured solar power needs to be stored, but the cost of battery storage has declined by a factor of 10 over the past 20 years. We have come to an era in which even financial analysts are talking about renewables becoming sources of cheaper energy. Naam states that if we are going to conquer the problems of the destruction and depletion of our resources, they will be overcome with the power of ideas and innovation. Ideas are the one resource that doesn’t get chipped or broken over time; rather, they naturally spread and accumulate. Ideas are the only natural resource that we inevitably have more of over time, and they can substitute for or multiply the value of every other resource. Simply put, ideas are our future. Naam spent 13 years at Microsoft, where he led teams to develop early versions of Microsoft Outlook, Internet Explorer, and Bing. He ultimately became Partner and Director of Program Management within Microsoft, working on technologies including machine learning and artificial intelligence. He holds 19 patents related to search engines, information retrieval, web browsing, artificial intelligence, and machine learning. Between stints at Microsoft, Naam was the CEO of Apex NanoTechnologies, the world’s first company devoted to software tools to accelerate molecular design. He wrote More Than Human: Embracing the Promise of Biological Enhancement, a non-fiction book that explains new technologies and argues in favor of human enhancement in order to eradicate disease, lengthen lives, and transcend the power of the human brain. Naam is the recipient of the 2005 HG Wells Award for Contributions to Transhumanism. Naam’s has written three science fiction novels. The first novel, Nexus, won Prometheus and Endeavour Awards. The sequel, Crux, was a finalist for the Prometheus Award. In 2014, he was nominated for the John W. Campbell Award for Best New Writer. The third book in the trilogy, Apex, was released in May. Naam currently serves on the advisory board of the Acceleration Studies Foundation, is a member of the World Future Society, a Senior Associate of the Foresight Institute, and a fellow of the Institute for Ethics and Emerging Technologies. 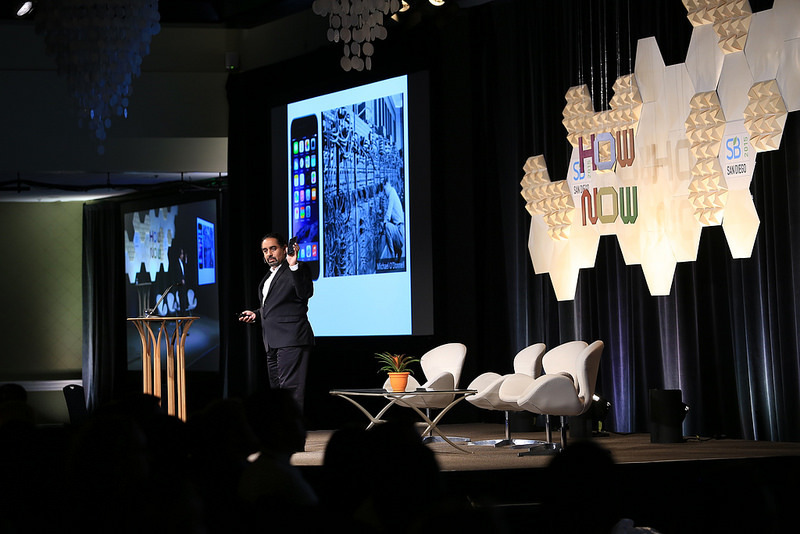 Ramez lectures on energy, environment, and innovation at Singularity University, where he serves as Adjunct Faculty. He’s appeared on Sunday morning MSNBC, Yahoo! Finance, on China Cable Television, on BigThink, and Reuters.fm. His work has appeared in or been reviewed by The New York Times, The Wall Street Journal, The Los Angeles Times, The Atlantic, Slate, Business Week, Business Insider, Discover, Popular Science, Wired, and Scientific American. In his leisure, Naam has climbed mountains, descended into icy crevasses, chased sharks through their native domain, backpacked through remote corners of China, and ridden his bicycle down hundreds of miles of the Vietnam coast. It’s safe to say that Naam has spent some time contemplating the world’s environmental problems. In 2013, Naam published The Infinite Resource: The Power of Ideas on a Finite Planet. Learn more at www.rameznamm.com.